Not a widely known trail, and definitely off the radar for the area, but ridden enough by in-the-know locals that the singletrack is well worn. All told, this trail needs to get some recognition. I'm not sure who has been taking care of it, but they've done a nice job. Heading south from Goya Road on Tortilla Trail, the trail head will be a hundred feet down on the left. It isn't far from the northern most point on Tortilla. You'll have to ford the river/stream to get across and once across it is a quick jaunt to the split. Left or right, you'll end up at this spot again, but I recommend going left. Left will bring you down the side of the loop that parallels 270S. It is full of twists, turns, switchbacks, fallen trees to hop over, at grade stream crossings and a host of other fun things. The beginning is a hellish uphill section that leave the legs burning for a break. Closer to the end, you'll start seeing the campground sites which may or may not be used. Ultimately, the singetrack puts you out on the dirt access road. Turn right and follow this for a while. You'll come around a right hand bend and see a bridge on the left side, this is the start of the other portion of the trail. Here is where it gets interesting. Some fallen trees from storms in 2012 force you to hop off the bike and lift it over, and some other sections are just dicey and tough. Thumbs up to you if you can navigate it without any issues. You'll eventually work your way back to the split location, hang a left and head back to Tortilla Trail. Someone has done an excellent job of keeping this unknown trail up to date and open. Trees have been cut up, new paths cut, paths swept of fallen leaves and generally everything is up to date and ready to be ridden. 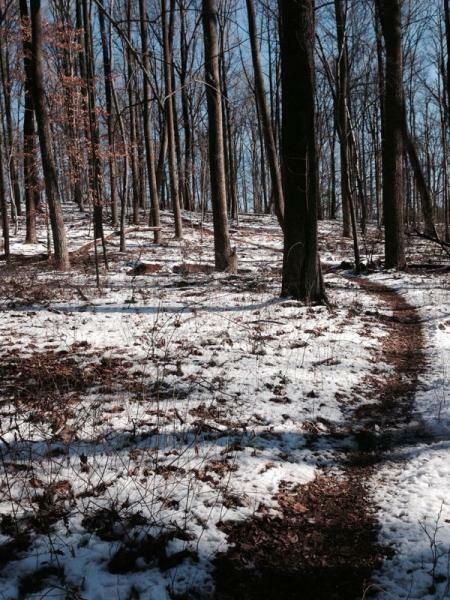 Next time you're in the Potomac/Bethesda area or at Cabin John Trails, give this little trial a look. Review: This Trail is really fun. I think a beginner could handle this but it would definitely be a challenge. I think this is a good intermediate trail. My friend and I first went on the Cabin John Trail. We decided to check out this trail. There is a tough climb to start but once u get to the top this trail is awesome. At the top there is a little hop to start then a sharp turn and some logs then some crazy fun flowy down hill and some little hops. There is one point in the down hill where u go super fast. To end it of is some fun flowy stuff. Overall this trail is awesome. And the climb at the beginning is worth it. I would recommend going to this trail. 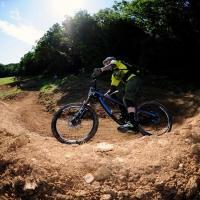 Review: Lots of improvements done to the trail including machine made berms and rollers. Might only be a 3 mile loop but it's super fun. Worth checking out if you're in the area and can be combined with the Cabin John trail to get about 14 miles or more. 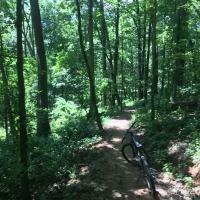 Review: A tight single track that winds along a creek for a while. There are creek crossings, log overs, some really fun downhill lines which you can gain some speed. Definitely a fun flowey ride. Lots of blind corners and some people walking on the trail. I rode for 5 miles, but the trail is longer than that. Review: As always, you have to view urban trails in context. This loop isn't a backbreaker or a substitute for 15 miles of single track goodness but it IS a surprisingly fun, intermediate level ride. And I think most beginners wouldn't get themselves into too much trouble if they wanted to push themselves. If you live in the immediate area, you should be very thankful that you have a trail this nice in the 'hood. And it's fairly primitive in use--I saw a huge buck deer and assume that he doesn't get much company most days. The trail is in excellent condition. Technically, there's not much that's going to challenge an advanced rider here, other than trying to ride faster and faster on a course that admittedly isn't really long to begin with. I am comfortably intermediate in my skills, and while I wish there were some more lung-busting climbs, the overall challenge of the course is fair. If you ride the road in the area, there are some decent rolling hills and a lot of bike paths on the road which is very much appreciated. Read the directions carefully about this ride--if you go in off of the Goya Road entry point, you need to take that first big left at the fork of the trail and cross the creek on your bike to get to the meaty part of this trail. If you go right, you're going to go on a beginner trail where you'll likely see joggers or hikers (and there are tight, blind corners on that part of the trail that make it dangerous for others to share with you.) Again, go left and plow through the creek to the good stuff. Review: I did this trail after doing a section of the CJT. If you are a geocacher, there are a couple caches along this trail. Those hills are a complete workout. Review: Rode for the first time today and GOOD LORD was it tough. There are some areas that just demand you get off the bike, but overall, the whole trail is fun and well worth the time and effort to find and ride. Met some nice people while riding, too. Well off the radar, but should be made known as it is a blast to ride. Someone has done a great job of keeping this trail open and able to be ridden. Ronald C. McDonnell Campground Loop MTB Trail 4.50 out of 5 based on 6 ratings. 6 user reviews.